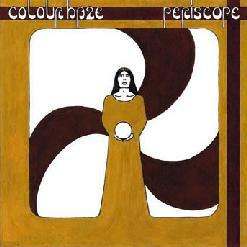 This is the latest release by Colour Haze and features mostly studio outtakes from Oct 1999. It is released on vinyl only in 1000 numbered copies on high quality 180 gram vinyl. The LP begins with Always Me. A slow building track in which the groove just intensifies as Stefan’s vocals get more intense and the guitar solo rips you in half! Antenna is next and builds upon the excellent bass line of Phillip and Mani and Stefan slowly build up on top of this before the guitar riff takes over. Again, Colour Haze music is best when heard Stoned! Pulse (re-recorded in 2001) closes the side and is one of the most powerful Colour Haze numbers. Side B begins with Sun, not to be confused with Sundazed. I really like the way the guitar riff and the bass line weave together and back and forth on this number. Great moods are created on this number. Periscope and Periscope (Breit Return) close the LP and are masterful, powerful pieces of music with some ripping lead guitar. Another Colour Haze classic! Visit the Electrohasch web site at: http://www.elektrohasch.de.